Celebratory rock & roll from Calgary, Alberta. Napalmpom is a rock & roll band. No, Napalmpom is the rock & roll band. Picture MC5 bombast with Thin Lizzy dual guitarmonies, AC/DC showmanship, hooks only The Exploding Hearts could write and the down-to-earthedness of early Black Flag. Perfect band, right? Well, they’re not that band (sigh! ), but they are trying their darndest to be. This is celebratory rock & roll. The Core Competencies Of Napalmpom…a rock & roll thesis statement on the dangers of bands as brands? A wink and a nod to the band’s own tendency to pat itself on the back? Or an album about playing to one’s strengths, even if those strengths are woefully out of fashion? The Core Competencies Of Napalmpom is an album of fine lines. It is an album of fines lines played very, very loudly. A much anticipated follow-up to 2014’s celebrated riff-heavy debut The Unconditional Love Of Napalmpom, the sophomore long player is a confident collection of hook-filled songs that manages to avoid playing simple rock & roll dress-up. By combining a genuine love of the big, guitarmony-filled 70s (think: Thin Lizzy, Queen, Boston) with thoughtful ruminations on the more eye-rolling tropes of the genre, musical and cultural, Napalmpom’s latest lands somewhere between rock revival and genuine indie rock songwriting. With big chords and ideas, the album is proof positive that the middle of the road is no place to drive…unless you’re passing cars on either side. Initially imagined as a rock opera about the public and creative personalities of two seemingly very different iconic rockers – Axl Rose and Paul Westerberg – as told through the eyes of Guns N’ Roses/The Replacements member Tommy Stinson (to have been titled Tommy), the idea was quickly scrapped to make way for a collection of songs truer to what Napalmpom does best: write joyous, guitar-heavy, unashamed pop anthems about light subjects like love and death and living up to expectations with integrity. Started as anything but a supergroup, this ragtag group of Canrock veteran sidemen (Forbidden Dimension, The Adam Brown, Beija Flor, Creeper, etc.) 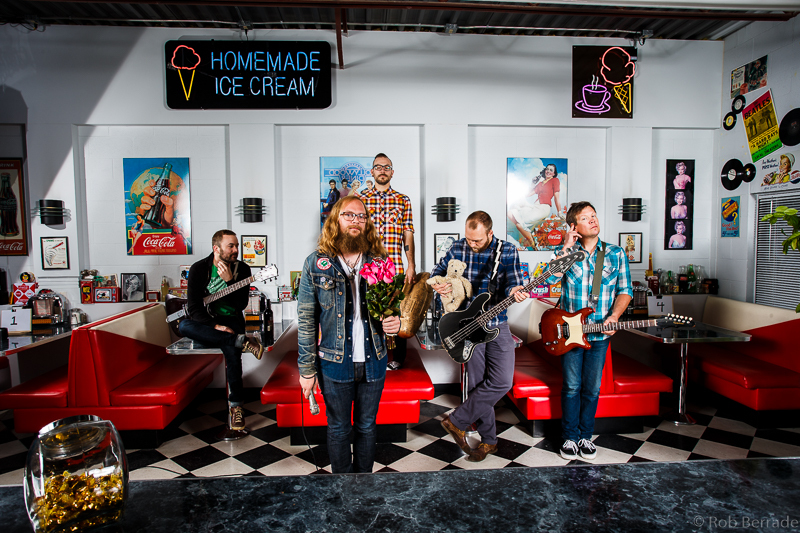 here flex not just their musical chops, but arguably for their first-time, their newly developed songwriting smarts. An album book-ended by songs about a judgment-free and important rebound and the intoxicating intimacy of new love respectively, finds the band both celebrating and thinking critically about what it means to write rock & roll songs in 2017. Each song is delivered through statement-making performances by frontman P.J. Lavergne’s charismatic and melodic vocal delivery. An offhanded band joke about the Canadian music industry being the most convoluted Rube Goldberg machine imaginable, devised to receive little more than a pat on the back, turned into a not just inspiration for the album cover, but a singular mission statement that guided the album’s development: that, at the end of the day, no matter how ridiculous it is to lug archaic and heavy equipment across the country simply to push some air and play some out of fashion b chords, it’s worth it if you can proudly stand behind every note and word. 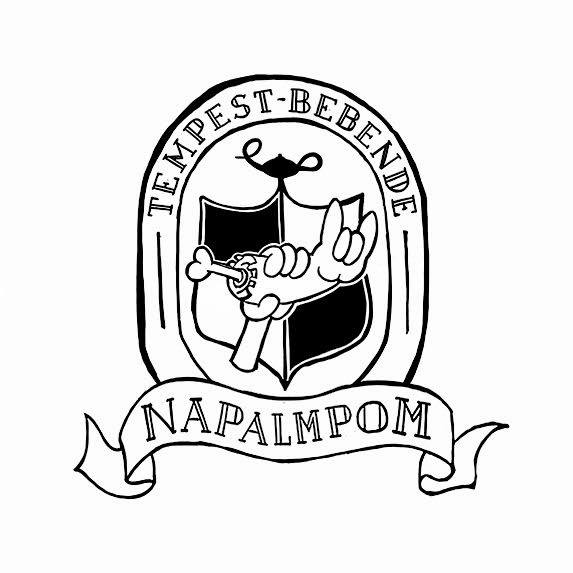 With The Core Competencies of Napalmpom, the band is doing exactly that. Each band contributes new original songs and a Canadian cover, before embarking on a two-week tour of Canada together. Public Animal did a Living Proof cover (“Don’t Let Me”) because they should be included in the same breath that whispers Personality Crisis/Nils/early 80s Canaduh but rarely are. The three originals highlights include: their first drum break on a song, their first crack at writing a theme for an imaginary TV show (Northern Girls) and the sludgiest 12 bars they’ve recorded yet. Produced by the band and mixed by Adrian Popovich (Tricky Woo) inside Frank Marino’s moustache. Napalmpom did a Jr. Gone Wild cover (“Cosmos”) for a variety of reasons: because producer Lorrie Matheson called them proto-Napalmpom, because frontman Mike McDonald’s soon-to-be defunct Edmonton record store, Permanent Records, keeps selling their LPs and because, well, they think it’s funny to watch their singer run out of breath trying to keep up with the lyrics to the “It’s The End Of The World As We Know It”-precursor. Their originals feature the first song they ever wrote together and a brand new one that is a middle finger to the usual macho rock & roll subject matter. Having already proven themselves as a must-see live band – a self-contained party unit – they released their debut LP on Teenage Rampage Records. The Unconditional Love Of Napalmpom is 9 songs, er, love letters to the entire history of rock & roll music. These songs range from honest to goodness freedom rock anthems (“Get With Me”) to stoner rock epics inspired by Nick Cave spec scripts (“Ashes Ashes”) to mini rock operas about the similarities in hockey and punk rock uniforms (“Greg Ginn’s Sweater”). What they share is the pure joy with which they are played. That joy extends to the album’s artwork. 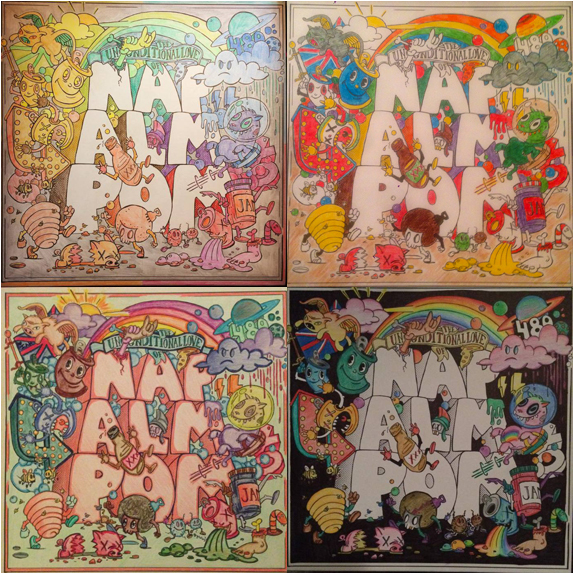 Drawing inspiration from the DoodleArt movement of the 1970s, art director Geoffrey Hanson (Robert Plant, Kings Of Leon) presents The Unconditional Love Of Napalmpom LP in matte black & white to encourage listeners to colour in their own copy. The first 200 copies of the LP even came with an official DoodleArt marker set! Speaking of colouring (!? ), following the departure of their original singer, Ian Thomas Day, to the United Kingdom in 2013, the Calgary-based band, made up of relative veterans (members of Forbidden Dimension, The Adam Brown, Beija Flor, The Silent Auction, Creeper, etc.) found his replacement, P.J. Lavergne, in the likeliest of places – at a local karaoke hangout. Everyone assumes he’s a roadie until he takes the stage. Then…then they fall in love with him. …and love is a common theme for these folks. While they might choose rock & roll itself as the subject they are smitten by, and though they might not always be proclaiming it as eloquently as Leonard Cohen on Songs Of Love And Hate, make no mistake, these are songs of exactly that: a love for music that understands that the ‘rock’ and the ‘roll’ are equally important in the equation and a hate for the assumption that anything with a guitar solo must be an ironic joke. Thanks for having us, Edmonton. Love to know we’re having an impact (on the graphic design of your pizza joints that have been open for much longer than we’ve been a band). Love to @99tenyeg / @realsickies / 20/20s and DJ @destinationvenus with all the jams. The middle of the road is no place to drive unless you're passing cars on either side.